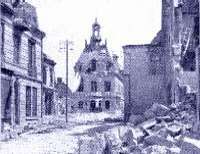 Aug 7-17, Div occupies the Fismes Sector (Champagne): On the night of August 6-7 the 28th Division launched an unsuccessful attack upon Fismette, which is [north] beyond the Vesle River, adjoining Fismes on its left side. The next day, after two attacks with heavy artillery preparation, parts of Fismette were captured and held. The town was completely occupied on August 10, but because of the German efforts to retake it, desperate fighting took place in the streets of the town almost daily during the next two weeks. August 11: At 1:00 P.M. Major Donnelly [Commander 3rd Battalion] was ordered to arrange a surprise raiding party of two companies and send them forward at 5:00 pm to capture prisoners, machine guns and material located in the ravines and sunken roads leading south from Mont de Pert and La Fosse Auloup. Companies L and M were selected for this and had to fight their way to the position designated as the jumping off place which was occupied by the enemy. Beyond this they were unable to advance, owing to the strong opposition and consequently suffered heavy casualties. They withdrew to Fismette, where Major Donnelly organized the defense of the town. During the day, a great increase in the enemy artillery fire was noted, consisting, principally of harassing fire on our positions and especially on battery positions. This fire was directed by the enemy’s planes which were constantly over our sector and in one case necessitated the movement of a battery. Harassing machine-gun and one-pounder fire continued from the nests north of the VESLE. August 13-14: Fismette was held by Major Donnelly's troops until their relief by the 109th Infantry on the night of August 13-14 and during the entire time they were subjected to heavy machine gun and artillery fire. Much hand to hand fighting took place in the streets of the village, there also being an attack with liquid fire. During the entire time the troops occupied Fismette it was almost impossible to evacuate the wounded and on the night of the relief, arrangements were made for carrying details, who brought all the wounded across the Vesle prior to the troops leaving Fismette. Sources: Order of Battle of Land Forces in the World War; Official History: 28th Division; American Armies and Battlefields in Europe.